W G Davies offer a full range of MAN genuine parts and accessories designed specifically for their products - supplied and installed with the company's latest long term MAN warranties as standard. Here at W G Davies we recognise that downtime costs customers money; wasting time waiting for the right part only costs more which is why, when it comes to parts, rapid availability is everything. W G Davies has access to some 12,000 parts directly and can identify any part a customer needs using MAN’s unique electronic parts database. 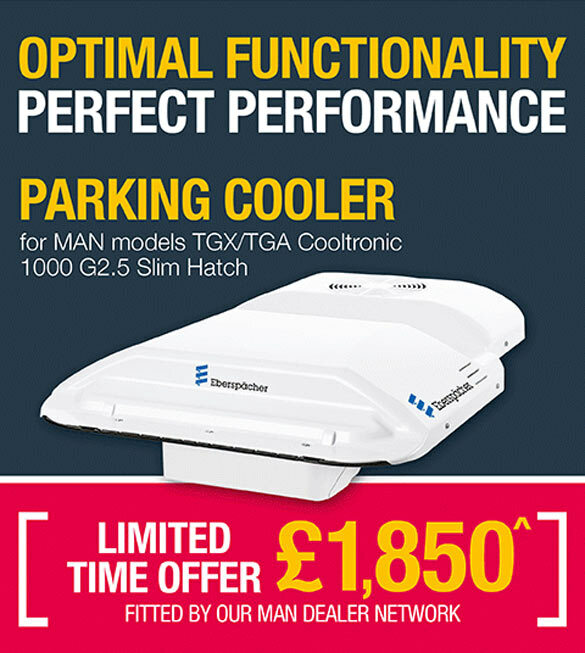 Keeping you and your MAN cool this summer, the new compact Cooltronic 1000 G2.5 Slim Hatch system is tailor-made specially for MAN truck models TGX/ TGA with XLX cab and MAN spoiler. The Cooltronic maintains a pleasant, uniformly cool temperature in the cab and reduces humidity to a comfortable level for the driver. A cooler cabin will also help improve driver alertness, and therefore road safety. Our models are independent air conditioners with electric compressors and a closed circuit. Cooling performance is automatically adjusted to minimize energy consumption, plus they operate with the engine switched off, meaning they avoid C02 emissions and are 100% environmentally friendly. The low weight, slim and compact design can be installed easily via the roof hatch, no drilling or engine modifications are required! Click here to enquire.